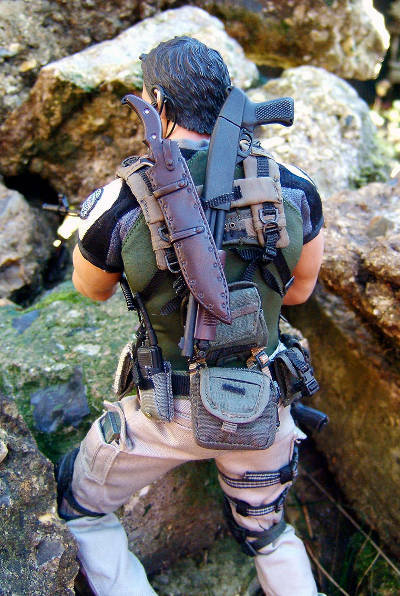 Jeff Parker is taking a look oat one of the new Hot Toys Biohazard figures tonight - tell us all about him, Jeff! Thanks as always to Michael. Now, a couple of years ago I reviewed the full range of characters that HT released from Resident Evil 4 (Biohazard 4 if you are in Asia), and I personally found all of them pretty impressive. Never before had video game characters been given such an impressive 1/6th treatment. 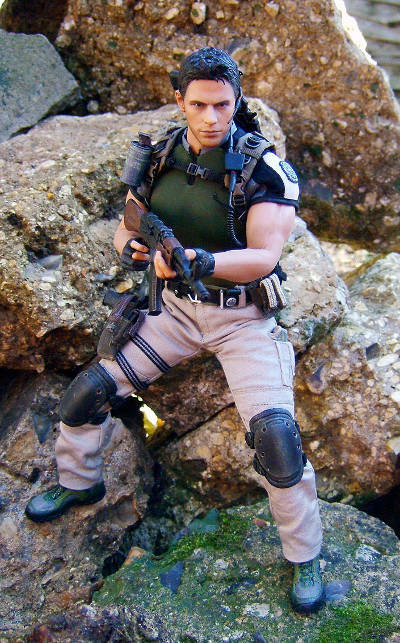 Since then Sideshow has given us Lara Croft and McFarlane have delivered some hugely impressive pieces from HALO, but in all fairness, these RE5 figures are on another level. 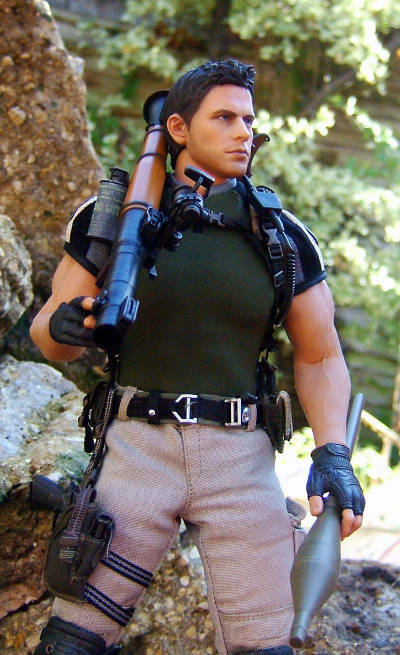 Chris Redfield has been one of the main hero choices in gaming for Resident Evil /Biohazard since its seminal off set over 12 years ago, yes, you could indeed argue that he’s been the official poster boy of the whole series. 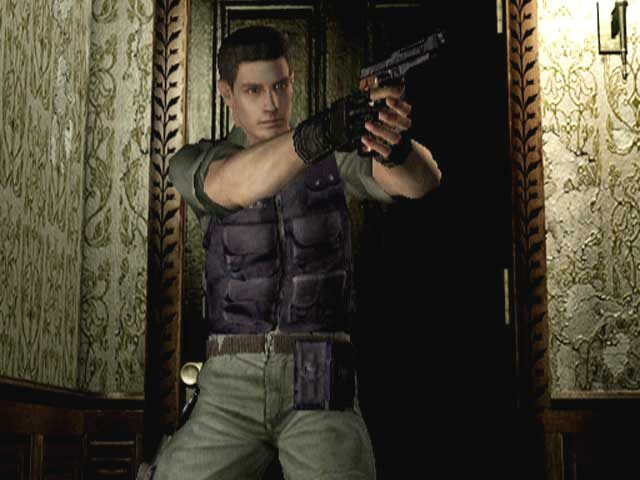 He was there at the beginning, one of the early members of S.T.A.R.S, he survived the Mansion Incident, and has been battling his former Captain Albert Wesker ever since. His physical appearance has changed quite a bit over that time as well. He started out as a fresh faced, action man of athletic, but average build and has evolved into a one man testosterone and steroid pumped zombie killing machine! 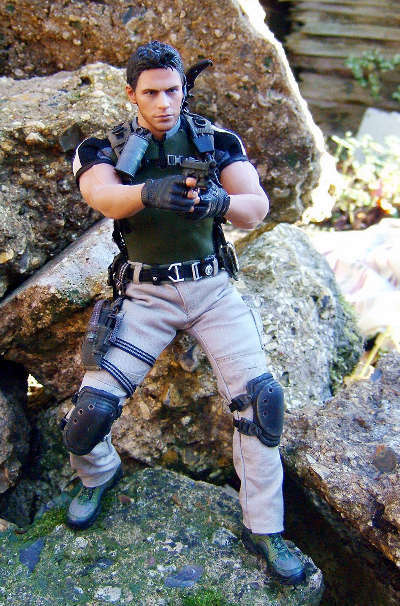 So, as happy as I was with the two versions of RE4 Leon Kennedy, can the RE5 Mr Redfield make me even happier? As our hero said, “There's one thing I do know... I have a job to do, and I'm gonna' see it through.” So I better take a leaf out of his book and get on with it! 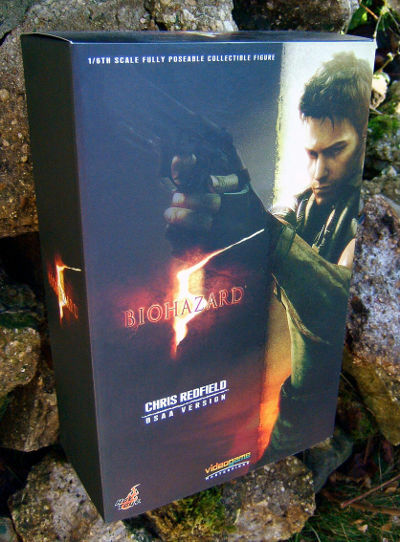 Mine came in a box bearing the Biohazard 5 logo rather than Resident Evil, I take it the ones sold in North America and Europe will have the alternate title, but I don’t know that for sure. The colour palette is borrowed from the branding for the game. So we have a dark background out of which the logo and character name appear alongside a picture of Chris, lifted from the game. The areas with the picture are laminated with a rough textured matte varnish which is very attractive and also pretty tactile. The back has a brief biography, production credits and pics of two of the other figures from the series. 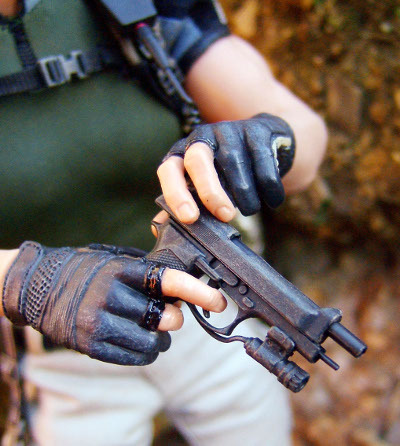 Like the earlier RE4 figures, this uses the magnetic side panel to hold the packaging shut, it lifts from the right and opens to the left, exposing a tray of weapons attached to the inside flap opposite a window showing the fully dressed figure. Inside he lies in a black vac formed tray held secure by a few twisty ties. So, another very nice box designed by Monster Jr and Sandy Lam, not Hot Toys best packaging, but still very attractive and it’s another solid addition to their line. This was sculpted by Kang In Ae, I’ve been very impressed by her work in the past on the M-icon range and of course most notably on her representation of Marlon Brando as Don Vito Corleone for Hot Toys groundbreaking The Godfather figure. So, we all now her work is good on real people… but how about ‘virtual’ characters, those gamer fan boys can sometimes be the hardest to please, bringing their beloved 2D pixels to fully fledged 3D life, but Kang has managed to pull it off… just about! I’ve spent a lot of time tracking down good pictures of Chris, like this, this, this and this, not to mention a couple of full body shots I link to below in the outfit section. So, this is a very good representation of him, she has certainly captured his eyes and mouth perfectly, however I do feel that his face here is just a whisker too long. The game version appears to have a slightly rounder face, it’s almost like it all just needs to be squashed up a little. If the forehead and bridge of his nose had been just a millimeter or so smaller I think this could have been near enough 100% spot on. As it is you need to look at this with an ultra critical eye to pick up on the ever so slight discrepancies. Once again Kang In Ae has delivered another beautiful bit of work and I found the optimum angle to view him from is a slightly elevated � angle, from which he really does look perfect. The work on the hair shows a fantastic degree of detail, and his little tuft that hangs down at the front is executed beautifully. 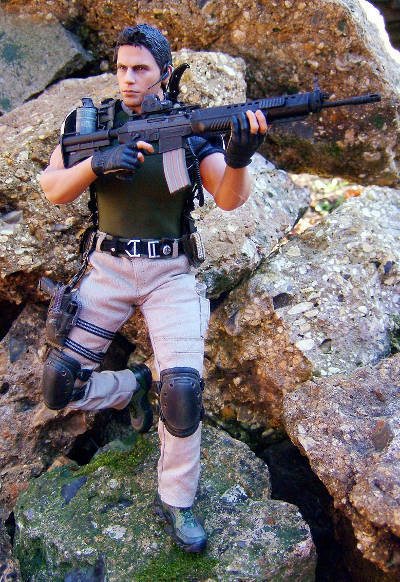 He also comes with 4 hands, all of which are wearing sniper tactical gloves with the first two fingers exposed. The two attached in the box are in gripping positions for the accessories, but he also comes with a fisted pair. Though I have to admit with his impressive array of weapons… why would you want to display him with fists? Once again JC Hong is on paint control, I don’t know why I mention it anymore, JC Hong and Hot Toys paint apps go together like Butch and Sundance, but mention it I will as he continues to produce just about the best and most consistent paint apps available out there. 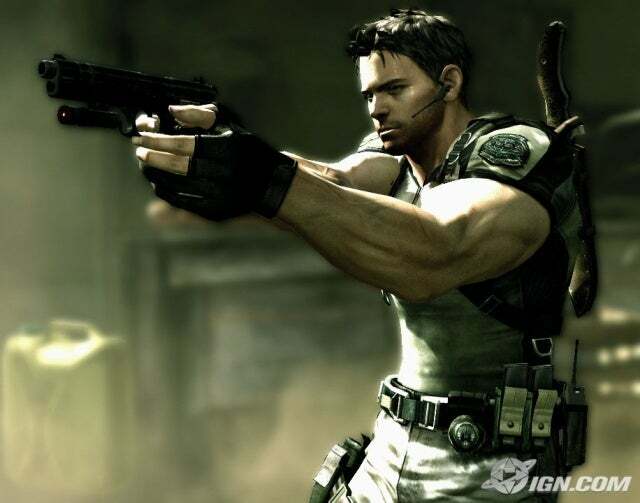 So here we have Chris as 3D rendered in RE5, the thing about characters in computer games is they ‘visually’ develop with each new game release, as not only does the character evolve but the technology that generates them takes leaps and bounds between each release as well. We are fast approaching a time when we won’t be able to tell real actors apart from their virtual counter parts. However, for now this is still quite a way off, as things are pretty convincing, but not THAT convincing yet, but the all important word in that sentence is ‘yet’! So to create an accurate paint app of Chris as he is seen in the game, JC’s job isn’t quite the same as when replicating a ‘real person’, but as you’d expect his observations come up trumps as usual. 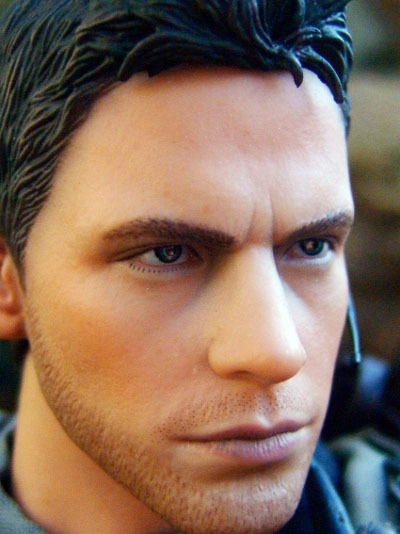 The flesh tones show nice subtle variations, with a slight darkening around the eyes and on the stubble shadowing on his chin. The lips are picked out in a convincing tone and the eyes are up there with some of his best work, crisp, well defined and glossy. Look closely at his eyebrows and eyelashes and you can pick out the individual hairs. 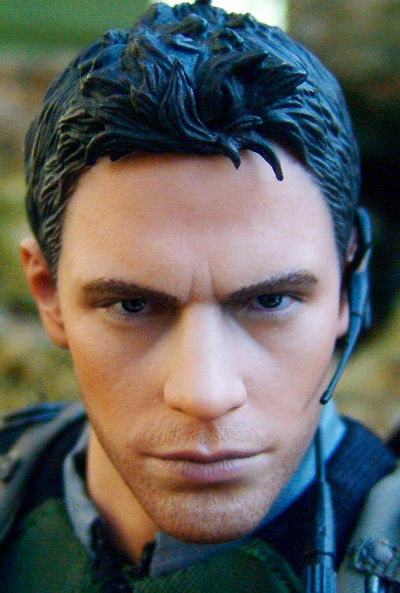 His hair style is in a uniform colour but appears a more matte colour in the low lying areas and shiny on the raised parts, it’s a relatively simple effect but does a fantastic job of enhancing all the details in the underlying sculpt. In short it’s another faultless job. Full score without a doubt! 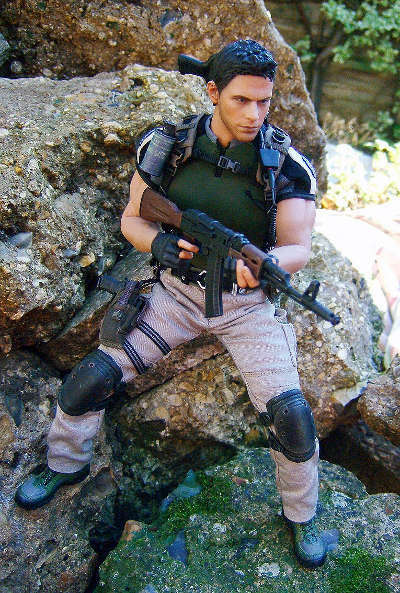 Chris comes on exactly the same body as the Dutch Schaefer figure from Predator, so I guess he deserves the same score. It’s a variation on the classic HT muscle body so the articulation is no where as good as the standard True-Type from the waist up. But for all that lack of mobility it makes up for it by being much more physically convincing. His legs are basically the same construction as a regular TT, but the whole torso from his groin to his neck has no notable articulation, it’s a rubber-molded body over a solid base. There is however movement where the head attaches to the neck, I could achieve a much better tilt from side to side on mine whereas looking up or down was virtually impossible but it can however turn freely. The arms also have a fair degree of mobility especially where the arms attach at the shoulders, the elbows can also bend and the wrists are the usual TT configuration. So after familiarising yourself with the limits of its mobility you’ll get a good feel for just what is and isn’t possible with this figure, but once you have that knowledge you’ll be able to coax some pretty sweet poses out of him. I have to say that I’m very much looking forward to seeing how the new Wolverine body turns out, as I feel it could be the way forward for muscular bodies as well. 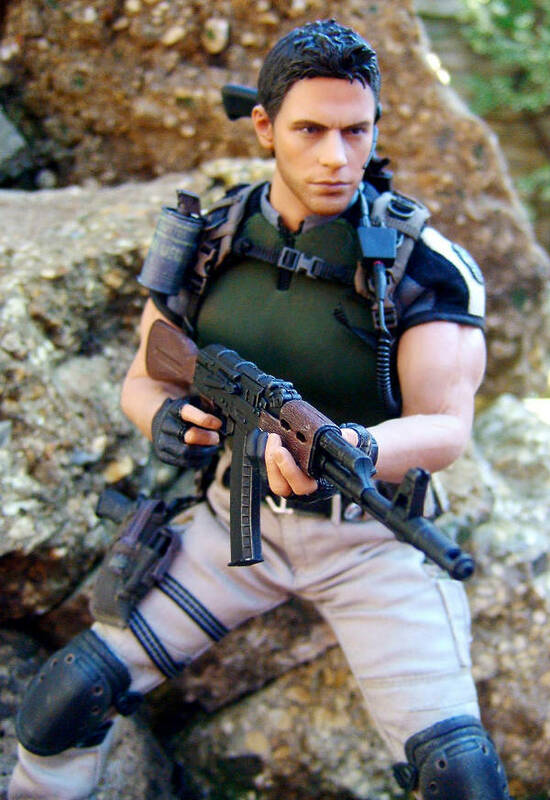 As much as I admire the aesthetic of the hidden joints on Chris here, I’m first and foremost a collector of 1/6th ‘action figures’ with the emphasis on ‘action’. If I want perfect arms and legs I should collect statues, but on the whole I don’t because I like to pose these things. So visible joints have never really bothered me as long as they are designed and engineered to work well and look as good as they can. Now, I freely admit I’m not a big gamer, a few spins on our (now antiquated) PS2 every now and then and I’m happy enough, though I freely admit that I was quite addicted to Duke Nukem on my Mac for a while back in the day… groovy! 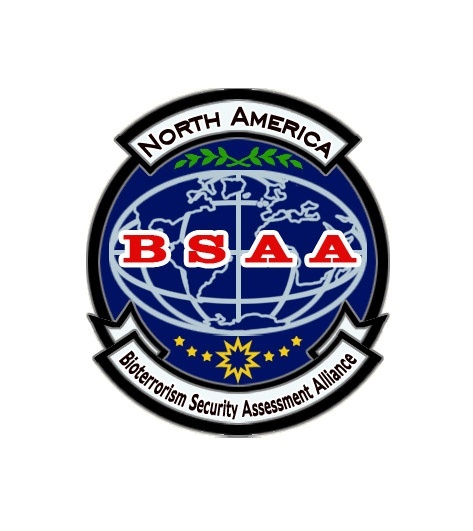 I do however like to do my research when reviewing anything, and there is certainly a wealth of info and images of Mr Redfield out there, and from what I’ve seen this is an amazingly accurate representation of his BSAA (Bioterrorism Security Assessment Alliance) outfit. This outfit was produced by Polland, no, not the country, that only has one ‘L’, I’m not even sure if Polland is a person or a collective, but whatever he/she/they are, they’ve done a great job of replicating the outfit as seen in the game. 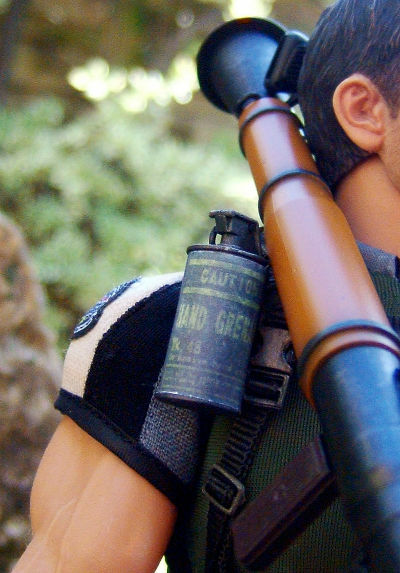 If you literally hold up your figure next to the full figure image I linked to above (which is just a little over 1/6th scale in height) you’ll see how amazingly well observed his fatigues are. 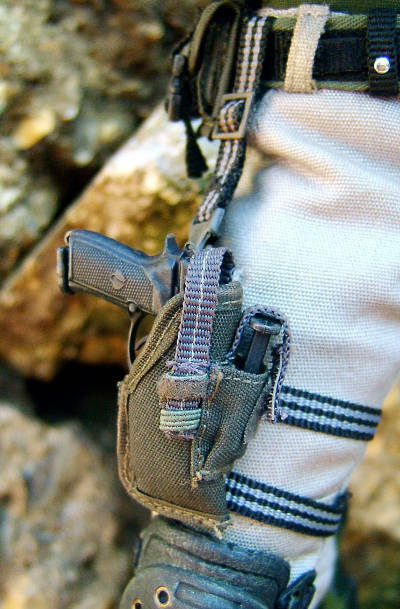 Every detail from the different coloured panels on his shirt with embroidered patches through to the elaborate webbing harness with it’s numerous pouches and pockets, all of which have opening clips and Velcroed flaps are replicated just about as perfectly as its possible at this scale. 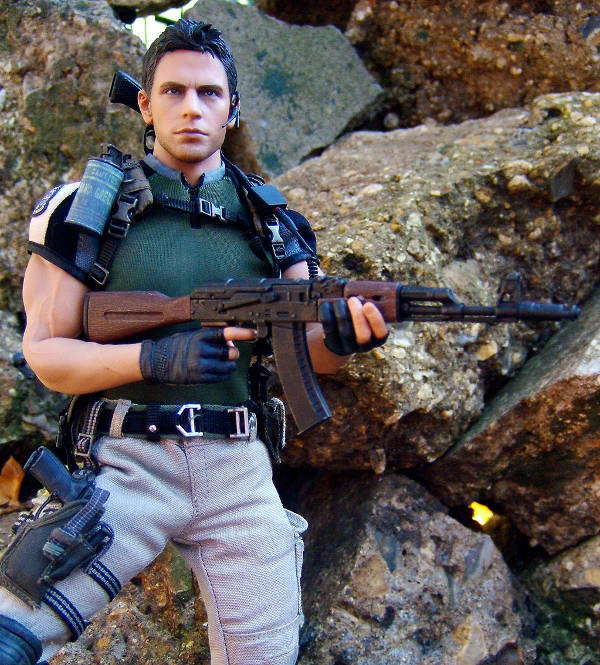 So far all of the Resident Evil figures have come with a very impressive selection of goodies, and Chris comes with a very imposing arsenal. I’m especially liking his RPG, Indy new they were cool, the Joker new they were cool and Chris certainly wasn’t gonna be left out. 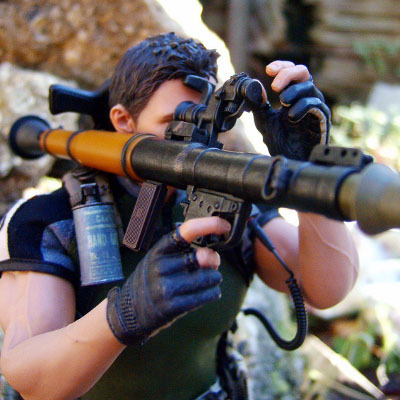 It has some great detail on the scope and rangefinder, one of the little gizmos on its side can flip out and the projectile grenade can also be removed… nice. But the fun don’t stop there, far from it! 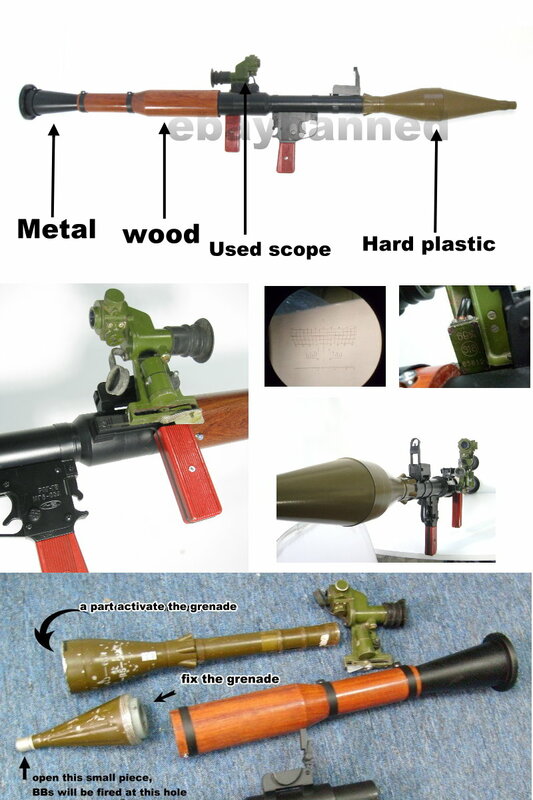 Guns, guns, guns… he also comes packing a M92F hand gun, an AK-74, a SIG 556, and lastly a pump action Ithaca shotgun. 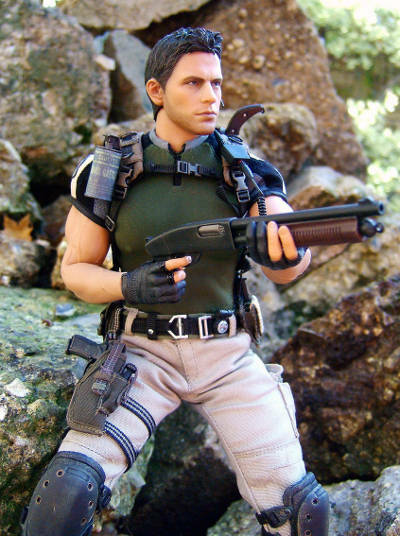 All the automatic weapons have removable magazines and articulated elements, but sadly the pump action on the shotgun isn’t functioning. 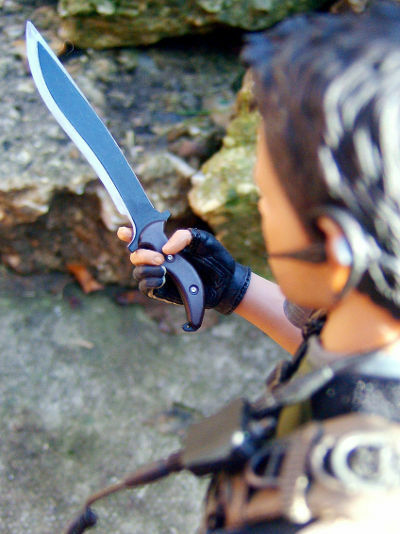 He also comes with his huge trusty combat knife for back up, unfortunately his gun grip hands don’t hold this too tightly, so a spot of Blu-Tack may be needed if you plan on posing him with it. 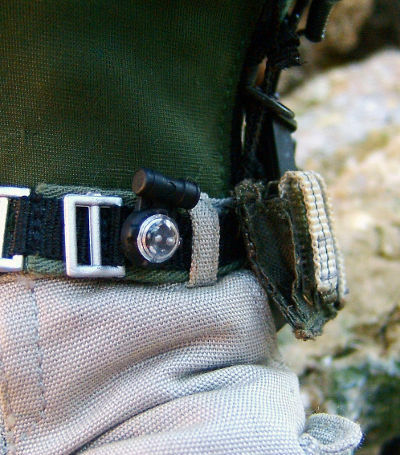 There’s a tiny compass to clip to his belt, a small data pad to slot into one of his pockets and a couple of boxes of ammo as well. 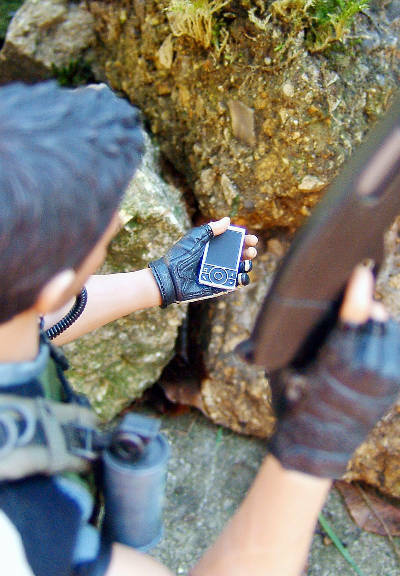 He also comes with an earphone headset attached to his field radio. This is similar to the one that came with John Connor, I did however find this one more difficult to keep in place and so decided to put a microscopic blob of Blu-Tack behind his ear and that kept it in place just fine. Lastly he has a classic HT black figure base, but I got mine to stand just fine in a number of poses without it. Now as I said at the beginning, these are on another level compared to the other 1/6th video game related figures available at the moment, but that is also reflected in the price. Where as you can pick up a McFarlane 12” HALO figure for $25 to $30 you’ll need to add at least another $100 for one of these babies, maybe $120. That price difference is however writ large in terms of the difference in the quality, attention to detail, articulation and abundance of accessories… not to mention the packaging! I based my score on picking this up for around the $135 mark, but I’ll leave you to use your own judgement on how many more stars to remove dependent on just how much more you pay over that price. I can find very little to fault here other than perhaps the price, it’s certainly not astronomic when comparing to other hi-end figures, but it is still undeniably quite high. However by scouting around you’ll find it a good site cheaper than the RRP, making him seem like a much more reasonable proposition. As I said above the head sculpt is near perfect, but not 100% there, at least not to me, I’m sure many might disagree. But taking into account the fantastically observed outfit, masterful paint application and his hugely impressive arsenal, then it’s hard to think of taking away anymore than � a star! 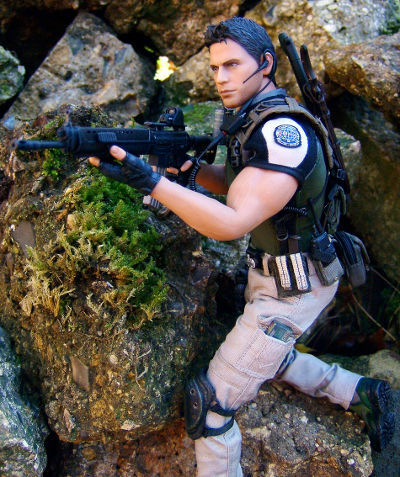 As well as this BSAA version there is a STARS version due soon as well, Sideshow have both versions of Chris for $149.99, but check out some of Michael’s sponsors below where you could make a saving of up to $15. Or you can try ebay where both are available with a wide variety of prices. This product was purchased for the review by the reviewer. Photos and text by Jeff Parker.